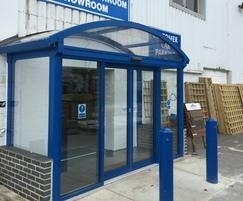 The Newport Isle of Wight branch of Sydenhams Builders Merchants recently underwent a radical renovation. The business had been on the premises for over 15 years and felt that a complete overhaul was needed in order to maintain its appeal to customers; an overhaul which included updating its entranceway. 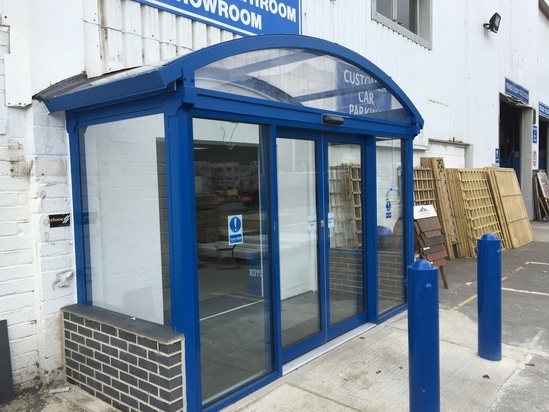 To keep with the fresh, modern theme the branch manager was aiming for, Sydenhams wanted to transform the main entrance into a fully enclosed structure that would protect customers as they entered and left the store. 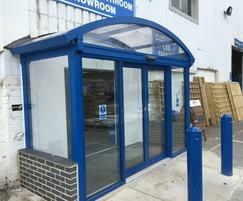 As well as protecting customers from the elements, Sydenhams wanted the shelter to act as a frame for the automatic sliding doors they intended to install at a later date. Unsure how to proceed, Sydenhams contacted AUTOPA after reading about a similar project that AUTOPA undertook for Huws Gray Builders Merchants in Wales. The result was a tailor made shelter that fits seamlessly into its environment, creating an appealing an attractive entranceway that boosts the visual appeal of the whole site. 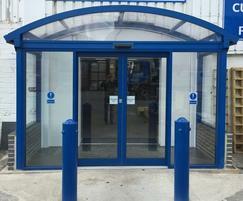 With the addition of the automatic doors, the shelter has created the fully enclosed entranceway that Sydenhams was looking for, and will continue to welcome customers into the branch for many years to come.